Eclipse chasing is a serious endeavor. It almost always requires adventurous travel, patience and energy. 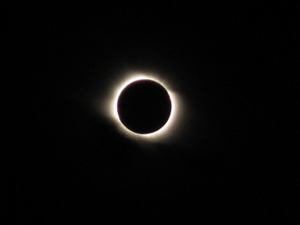 Total solar eclipses are exceptional events and occur when the sun, moon and earth are in perfect alignment; with the moon obscuring the sun's light as seen from the earth. They usually occur every 18 months or so and at most last up to 7 minutes, 40 seconds. The first time I chased one was with my 16 year old daughter in 2006 in Cappadocia, Turkey, not far from the first recorded total solar eclipse observed in Ugarit on May 3, 1375 BC. We were in the company of experienced chasers from Mexico and had traveled over dusty, bumpy roads for several days to reach our designated spot along the "path of totality" -- the path over the earth where the moon completely obscures the sun -- a band approximately 150 miles wide. There we waited -- with the other "umbraphiles" who had appeared from all corners of the earth -- for our fleeting yet magical eclipse moment. This one would last 4 minutes, 31 seconds. 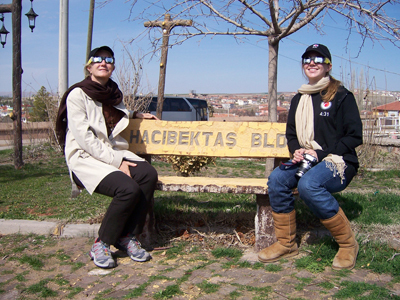 Mistakenly, we thought we had more time to be cultural tourists, and so left our fellow chasers in the observation field and headed to the nearby town of Hacibektas, named after the philosopher and contemporary of the Sufi poet Rumi. But once there, suddenly the experience was upon us. We were in it! We scrambled to find a place to "watch" as the sun vanished, the birds raced, the temperatures dropped, and an instantaneous darkness leaped upon us. As the street lights popped on we shivered and banded together for warmth. The local villagers appeared en masse to witness the phenomena, chattering among themselves in excitement. Afterward, when we were still giddy and ecstatic, a dear friend and veteran eclipse chaser extraordinaire, informed us we could not call ourselves "eclipse chasers" until we had a second total eclipse under our belts. Aha, we couldn't wait! Once home in California, my daughter and I raved about our eclipse moment and we could tell that my husband and son felt that they had missed something. 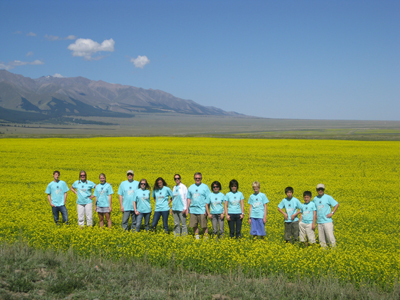 So two years later our family planned a summer vacation trip to China entirely around the August 1st, 2008 eclipse that would cross Siberia and Northern China. We joined forces with an Italian family of five and a Chinese family of four and after touring Shanghai we flew to Urumqi, the capital of the Xinjiang Uyghur Autonomous Region near the border of Kazakhstan. We traveled by mini bus for 4 days across the Gobi Desert, following the ancient silk route, to our "spot" on the border of Mongolia. Along the way, we saw glorious landscapes, rode camels and then horses with Uyghur horsemen across magnificent sand dunes, saw yurt villages, and ate some of the most unusual and, yes, challenging food ever cooked. We eventually found our way to a tiny Uyghur encampment located in the middle of the "path of totality" where we waited for the eclipse. All along we noticed that we were one of the few family groups traveling this eclipse route. We were surrounded by an eclectic group of aficionados from around the world, but no families. Why was that? This seemed to me the ideal family vacation, in that we shared travel, excitement, cultural immersion and a spectacular natural occurrence. While waiting, my daughter and I attempted to explain to our group what we knew of eclipses. They were to be patient, wear their glasses and anticipate the most awesome thing to ever happen to them. The eclipse came, and it was a totally different experience from our first encounter. I've learned that each eclipse is unique, which is why I think it is so difficult to explain to others what to expect. For me it offers an uncanny and profound perspective of our place in the vast universe. This was a much shorter eclipse, a mere 2 minutes 27 seconds, and perhaps it was location or the intensity of the eclipse, but we all felt that it was awe-inspiring. In the eerie glow of its departure our delighted 10 year old son and his Chinese pals exclaimed: "We want to see the next one, when is it?" The history of solar eclipses is fraught with question of who was the first to predict these spectacular astronomical events. The first prediction of an eclipse is generally ascribed to Thales of Milete, who according to the historian Heroditus, predicted an eclipse in 585 B.C. Aristotle, Ptolemy, the great Indian mathematician Aryabhata, the Arabian astronomer Ibn Junis, the Chinese astrologer Li Shu writing as early as 2650 BC, and the Renaissance astronomer Peter Apian as well as the Mayans, made predictions and drew eclipse diagrams. However, the first accurate prediction was made of the 1715 eclipse by the renowned astronomer Edmond Halley. Not only were his eclipse maps incredibly accurate, they were the first to present the path of the eclipse looking down on the earth's surface from above (a method still used by NASA). The NASA website now has a five millennium catalogue of solar eclipses. 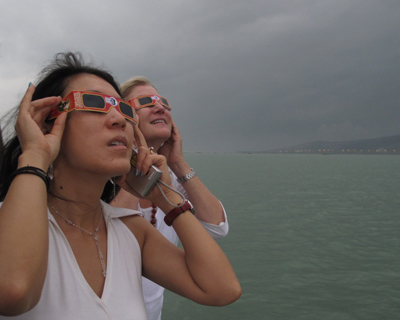 The longest solar eclipse of the 21st-century occurred on July 22, 2009 -- just a week ago -- crossing from India to China before moving over southern Japan and then off into the Pacific Ocean. It was visible from some of the world's most densely populated regions, and in some parts of Asia lasted as long as 6 minutes, 39 seconds. Millions watched in wonder as the sun was blocked by the moon and total darkness descended in the middle of the day. Again, I managed to be there. Several months ago I had been invited to be part of an awards jury in Inner Mongolia for an architectural prize (100 Ordos). Accepting to participate, I asked if it was possible to coordinate my visit to Beijing with the total eclipse date of July 22 and they were most accommodating. This time I was there without my family, but with a group of Chinese architects and urban planners watching through the dense cloud cover from a boat floating on Tai Lake near Suzhou, 2 hours outside of Shanghai. The sun was only glimpsed occasionally amid heavy cloud cover and it began raining and thundering right as the eclipse began. It was distinctive and fabulous -- the thrill for me not at all lessened by cloud cover and oblique viewing but rather heightened by the realization of another unique sighting. I wonder how many of the millions who experienced this full total solar eclipse last week will join the chase and like me become eclipse chasers. All I know is that there is room for all. Throughout history superstition has seemed to haunt the moment when earth, moon and sun are perfectly aligned, and this was certainly the case in China this year where tsunamis, hurricanes and other disasters were predicted. Many people stayed inside fearing such exposure, yet by all accounts, this latest solar eclipse was one of the most viewed in the history of man. The July 22 eclipse will be the longest of its kind until 2132, with the longest prior to that having been July 11, 1991, which lasted 6 minutes, 53 seconds and was visible from Hawaii to South America. Any given spot on the Earth's surface will host a total eclipse on average once every 375 years and your chances of just walking outside and seeing one are pretty slim! So chasing them down to be in the right place at the right time, is the only way to participate in this phenomena. Based on personal experience this alignment of the sun and moon are not to be missed. The next total solar eclipse will be on July 11, 2010, but will occur almost entirely over the Pacific Ocean, where Easter Island -- home of the famous Moai giant sculptures -- will be one of the few places for viewing it from land. Now that I am an eclipse "junkie", having graduated from eclipse chaser status, I think I will soon be investigating how I can manage to be in the "neighborhood" for that one too. And in case I miss it, the next eclipses after that will be on November 13, 2012 over Australia and on November 3, 2013 over mid-Africa. Who knows, maybe I'll see you there. Oh, and don't forget the family!